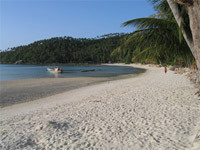 Chaloklum Diving has worked closely over the years with a few of the better bungalows and resorts on Koh Phangan. If you intend to go scuba diving or to make that PADI course with us, here are a few convenient places to stay. Chaloklum Village resorts are mainly located along the beach, no more than a 5-10 minute walk away from town with a choice of good restaurants, a few bars, shops, etc. 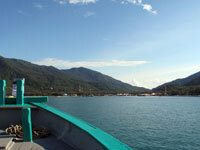 They are also more convenient for our boat dive trips, which leave from Chaloklum pier. Mae Haad Bay and Koh Ma is still our favourite spot on Koh Phangan. 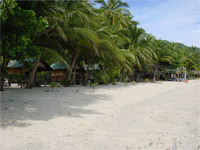 It’s situated on the North West corner of the island with a nice coral reef to explore. Haad Salad Beach is the next bay down the West coast of Koh Phangan. 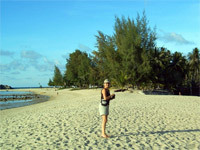 It has a nice, rather busy beach enclosed by coral reef – now the location of a few luxury resorts. Haad Yao (literally “Long Beach”) and Ao Chao Phao are located to the South of Haat Salat, further down the coast with a wide variety of resorts, bars and restaurants. Thongsala is the main town and ferry port of Koh Phangan with numerous banks, booking offices, a Post Office, a wide range of restaurants, bars and shops, plus a variety of other entertainments. In the rainy season our diving trips sometimes depart from the pier here too. Baan Tai is in the South of Koh Phangan, quiet and peaceful yet convenient for both Thongsala and Haad Rin full moon partying. Snorkelling or scuba dives are not possible here, as the reef starts a long, long way from the beach.